“The Daly River Girl began its life in 2013 over a cup of tea with a fellow arts peer,” says Tessa Rose in her program note. The making of the performance has taken four years and includes several creative development periods; one with the Yellamundie Writers Festival in Sydney and another in Darwin supported by Brown’s Mart where the play’s director, Alex Galeazzi and Tessa Rose worked intensively on the script to balance the painful stories with lighter moments from Tessa’s extraordinary life. This development resulted in a work-in-progress showing which, even then in its raw state, showed clear signs of the powerful piece to come. Tessa Rose is a warm and compelling performer who speaks directly to the audience, telling her story in non-linear segments that move fluidly across her life. 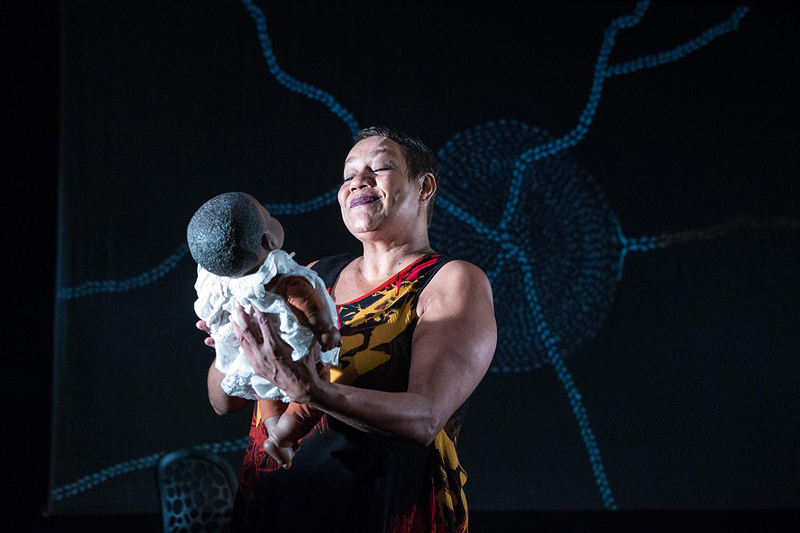 The audience follows her journey — her early childhood with a Seventh Day Adventist foster family in Perth, her failed fostering with three other families, her adult career as a successful stage and screen actor in Australia and on tour in Europe, her teens as she is reunited with her Aboriginal family in Daly River, her excruciating experience of domestic violence as a young woman. Tessa Rose bares it all in a scrupulously honest exposé of her life. The play opens with Naina Sen’s video projection of a group of young girls laughing as they sing “Ring a ring o’ Rosie” and dance in a circle with hands held. Backing this is Panos Couros’ gently eerie, suspense-filled soundtrack which evokes the essence of this play — the melding of horror and laughter in the life of a resilient survivor who recounts her stories with wry insight. As the film ends, the lighting changes to reveal Tessa behind a scrim, her face framed in the centre of a projected artwork by Tessa’s sister Jacqueline Marranya — a circular pattern of dotted pathways with tendril paths branching out, each animated with a colour reflecting the story being told. The animation is subtle, almost slow motion so that a path is often fully coloured in before being noticed and then fading to black and white only to be coloured in again, while the evocative soundtrack both punctuates and links the various segments of story. Standing before a projected photograph of her younger self, Tessa recounts the experience of her first Shakespearean role in A Midsummer Night’s Dream, reciting her lines as Titania. Phil Lethlean’s lighting design and Jessie Davis’ lighting operation are seamless as action shifts frequently from behind to in front of the scrim, into film projection, into images of Tessa’s past theatre productions, into animation of Jacqueline’s artwork. The technical complexity is smoothly done but Tessa Rose’s charisma is such that some of the most powerful moments occur when she appears in front of the screen with nothing but herself and her extraordinary life story and addresses the audience directly. She does not shy away from embracing the hardships and trauma of parts of her life. There is the repeated refrain “falling… falling” backed by a teeth-gritting soundtrack as Tessa clasps her head in response to cruelty from a violent partner, a bully at school, a casually cruel family member and rejection by her Daly River family for “not being black enough.” It is a story that is unfortunately all too familiar, but Tessa Rose’s humour and extraordinary resilience offset the darker moments. 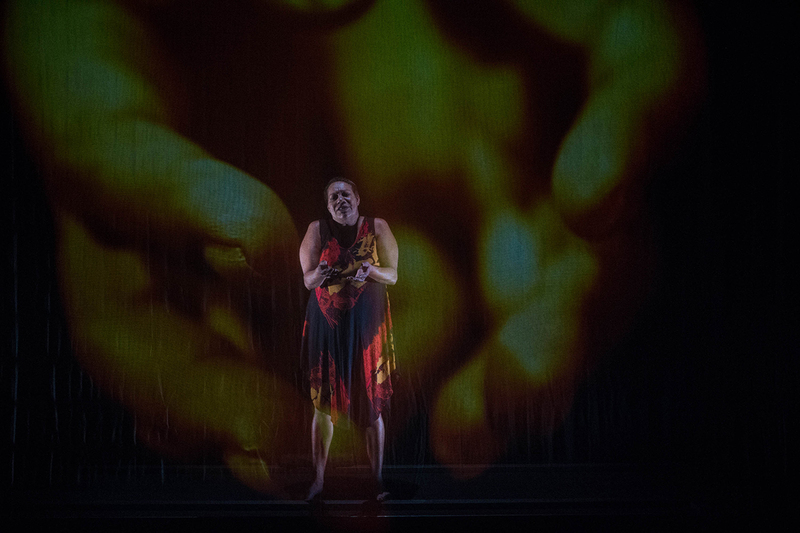 The Daly River Girl is a brave and engaging solo show from one of Australia’s known and loved performers. The NAISDA-trained performer (National Aboriginal and Islander Skills Development Association) sings, acts, dances and she and director Alex Galeazzi weave these together with great understatement, not simply as a showcase of Tessa Rose’s skills but instead as a journey through a varied life and performing experiences. 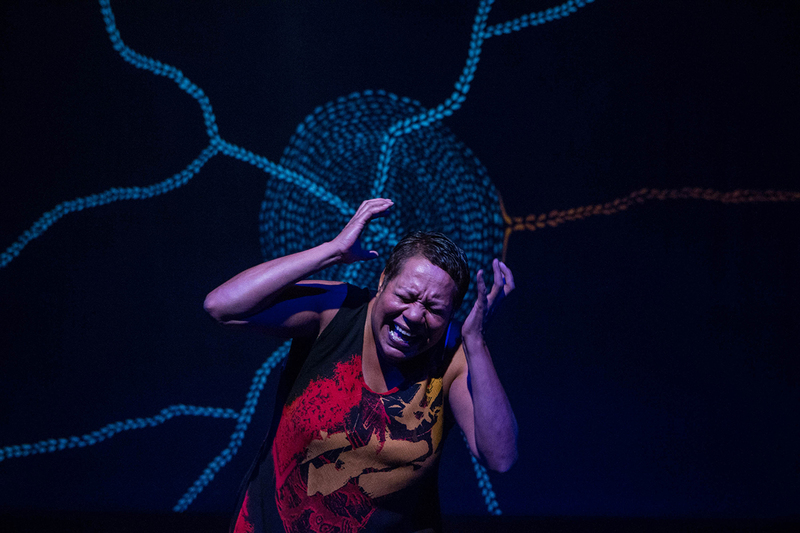 The Daly River Girl is a great piece of story-telling by a compelling performer. I anticipate that it will continue to develop and refine and will captivate audiences around Australia and overseas.